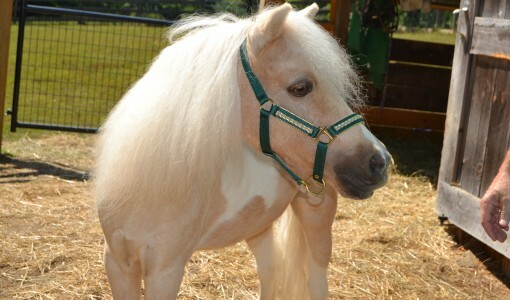 Miniature horse, Crescendo’s Best Kept Memories, was just four years old when he suffered his first bout of laminitis. Episodic lameness also led to a Lyme disease diagnosis, but when traditional treatment did not ease symptoms, owner Lynn Paulson brought “Dude” to a place where she had a lot of previous success—Tufts Hospital for Large Animals. Together, the Internal Medicine and General Diagnostic and Surgery Services performed a variety of tests and treatments, including an extensive metabolic work-up, digital X-rays, venograms, constant icing, and coordinated surgical and farrier care. The tests revealed that Dude was severely insulin resistant, partially due to genetics, and he was started on medication and an even lower carbohydrate diet than he was already on. Now, with his treatment, Dude’s hooves are healing and he is sound. He is back to trotting around his paddock with his barnmates and enjoying life. “The horses teach us something new everyday and the biggest lesson is to savor each moment,” says Lynn.